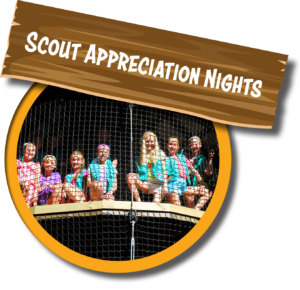 We love serving Girl Scout groups here at Treehouse World. We share a lot of the values that we want our kids to grow up with. Building confidence, understanding our place in the natural environment, and learning to face challenges alone and as a team. 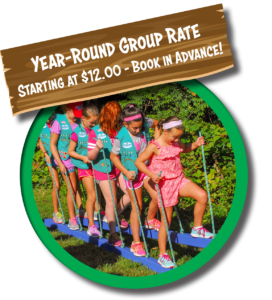 At Treehouse World, Scouts make progress toward scouting badges, host team building events, and have a great time while they're at it. This experience is not open to the general public. Availability is limited. Booking is on a first come first serve basis. 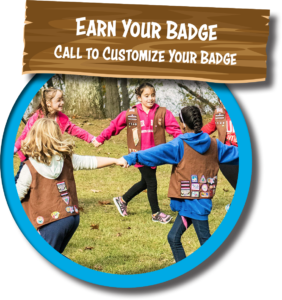 1 (one) free Chaperone (must be 18 years or older) per 6 Scout participants. 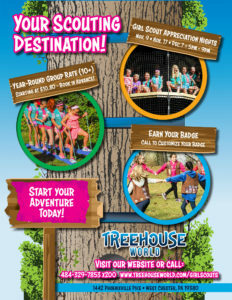 Must register together as a group to get the free Chaperone entrance. The Chaperone fee will be credited back once checked-in at the event. The park is lighted to safely navigate paths and activities. We do suggest bringing flashlights.